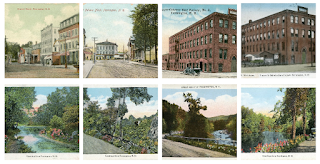 I've been working over the last few months to bring together an exhibit in the museum which contains the varied photo postcards of Farmington NH. Most of these were sold in local shops as souvenirs and as easy ways to send a short message, via post, in the late 1800's and early 1900's. 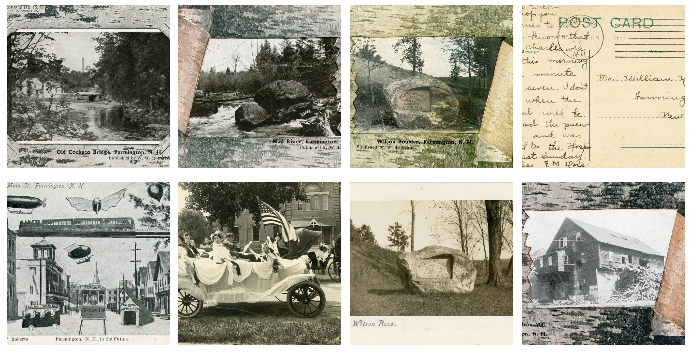 These postcards tell the colorful stories of Farmington via photograph and cover subjects from Farmington's early agriculture, to the town industrialization, to landmarks, memorials, and buildings throughout the town. A few cover prominent figures. The decades represented range from the late 1800's though the early 1900's. 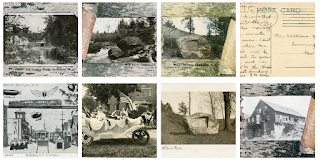 Many are black & white, some are in sepia tones, and others are hand colored. 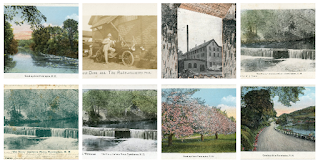 I have them in two parts in the museum, a section that has loose single postcards we've received over time or purchased for our collection and those that reside in the postcard collection binder, which were often in lots or as gift collection after someone's death. Most are blank on the back side, but some were stamped and posted and have short notes or updates. They are a great way to look at handwriting and distance conversation, from the late 19th and early 20th centuries. Right now, I have about half of the postcards scanned. About half of those are public in the Museum of Farmington History. Hopefully I'll have the other half scanned in this month and then I can work on making them public in the exhibit. I'm putting all of these in the online museum together to keep their item numbers in the same range, as they are mainly together in one flip book in the physical museum collection. As I make more public, there will be more tab pages to create separate pages for better load time and easier preview selection. I hope you find them as interesting as I do. They are a very important contribution to the collection. I look forward to adding more to the museum exhibit. If you have Farmington, NH postcards you would like to donate to the museum, especially if you do not see them in the collection, please reach out to us at farmingtonnhhistory@gmail.com or send us a message on Facebook.